I started with a long sheet of bulletin board from the work room. 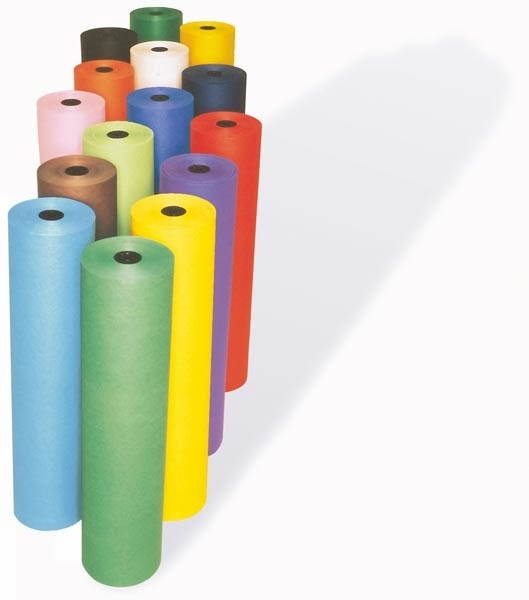 The kind that you pull of the roll to decorate your boards with. I did not cut any paper off the frame from the top or the bottom. The width of the paper I used was 36 inches. The length of my ten frame is 66 inches. Your frame could be bigger, but you probably do not want it to be any smaller if you want your kids to be able to stand in the squares. First, I folded the paper in half from top to bottom. I lined the edges of the ten frame in tape and made a line of tape down the middle on top of the crease. I used dorm room tape to line the edges and mark the frames. I measured the frame from left to right. Then divided the length by 5 and made each frame that size. I marked the frame at the bottom and the top then used a yardstick to connect the marks. I placed the dorm tape down on top of the lines to make each box. 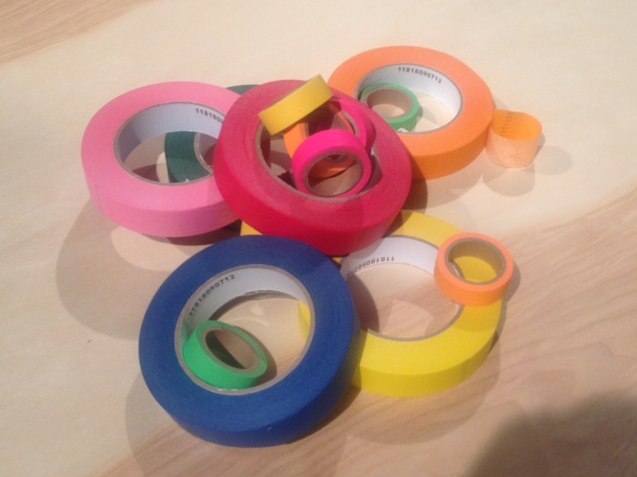 I purchased my dorm tape at Mardel, but I have seen it at other teacher supply stores. After the frame was made and taped off I folded it in half and laminated it. Then I cut it out and used an exacto knife to open it up. I folded it in half again the other way and laminated it again. I cut it out and used an exacto knife to cut it open again. I hope these instructions make sense. Comment below if you have more questions. I will be happy to answer them. We are finishing up our unit on numbers 6-10 this week. 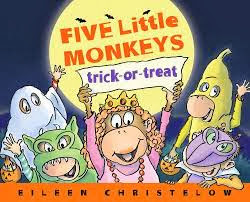 We ended the week with the book Five Little Monkeys. 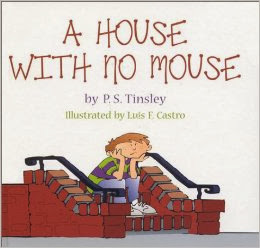 We have been working on building number sense for a long time and using different picture books has really helped to keep my students engaged and wanting to practice the same skills over and over. We used a large ten frame and our own little monkeys to practice counting up from the number 5. Each time we started with 5 and counted up to find how many monkeys were in the ten frame. We started with the ten frame for more support and then we moved away from it and counted up using just the monkeys. We worked on one to one correspondence in several ways. We matched up monkeys with the animals they switched costumes with in the story. We also joined hands to show the one to one match between the monkeys and the animals. We continued one to one matching using just the picture cards. We also used this activity to compare sets and talk about greater than, less than, and how many more. One of my students lined up all of the animals in a line across just like the monkeys. He did not have one to one correspondence in place. He thought that all he needed to do was make a line with the animals. These friends helped him by showing him he needed to turn some of the cards sideways to make sure each monkey was matched one to one with each animal. My students used unifix cubes and small monkey pics to act out what we were doing in the large group model and to practice one to one independently when we were done. We are still working on decomposing numbers. I have students help me model a few examples. Then I give my students their own pieces to work with while I continue to call students to model for us. This offers extra support for those who need it and gives everyone a chance to practice the entire time. It is also a great way for me to assess who has mastered the skill and who has not. This has been the most effective method I have found for keeping all of my students engaged and learning the entire time. We used the large ten frame and monkeys to figure out how many more we needed to make 10. We work with 10 every day as part of our daily number sense routines and this was just another way of practicing that. Students used their own ten frames and monkeys while we worked off the large ten frame. My students are really getting great at subitizing. We also did some show me math with our little monkeys. I got this idea from a Marcy Cook in-service. I said things like "show me 8" or "show me less than 5" or "show me more than 6", etc. Students can show me by making sets or showing me the number or doing both. Take a look at my little one who is laying down. After multiple conversations about this I eventually tripped over him backward and kicked the little girl in red in the eye :( Black eye style and all. That's why she has an eye pack. Who knew that math could be so exciting??!!?? You can grab the monkeys clip art here. We have been learning about technology in social studies. We talked about all of the different kinds of technology, the ways technology helps us, and the ways technology has changed over time. We talked about what technology means and what it is- physical devices that help us - any tools, machines, weapons, appliances, and instruments that help us. It is anything that helps us create, communicate, solve problems, and/or acquire knowledge and skills. We made a venn diagram to compare technology we had then and technology we have now. Some pictures really could go in one or the other or both. I let my students lead this discussion and we grouped pictures based on their thinking. If they could justify their thinking then I accepted wherever they said the picture went. We brainstormed all of the different ways that technology helps us. Then we sorted pictures of different types of technology into the different categories. We talked about how some of the technologies help us in more than one way. You can download all the technology pictures I used here. 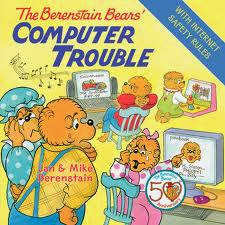 We read Arthur's Computer Disaster. Then we made connections with Arthur. 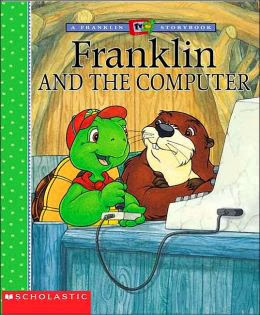 Here are a few books we read about computers and technology. Last week I came across the idea for a stamina party and thought I have to do that with my kids because they have worked so hard to build their stamina and done such a great job at doing it. It is truly one of my favorite times of the day- looking out and seeing all of my kids reading the pictures, retelling stories, and pointing and reading words all at the same time. I thought the forts may throw our reading off for the day, but my kids this year are so awesome that they kept on reading forts, flashlights, cookies, and all! 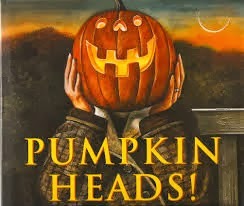 We read the book Pumpkin Heads! and made our own pumpkin heads just for fun! My dissertation is a study on how we gender young children in early childhood classrooms. 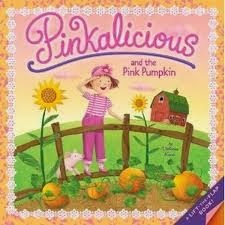 A running theme throughout my study has been color, so when I came across the book Pinkalicious and the Pink Pumpkin I knew I had to use it in a lesson. We area learning about informational text so we made a Venn Diagram and compared a made up story (Pinkalicious) to an informational book (Pumpkin, Pumpkin). And of course we painted pink pumpkins. My boys cannot stand the color pink and they refer to it as a "girl" color all of the time so I wanted to see if I gave them the option of painting with bright pink paint and pink glitter or orange paint if they would change their minds about the color pink. As you can see only 3 boys chose orange and in the end their choice had nothing to do with not wanting pink. This was one day that everyone- girls and boys included- LOVED the color pink. 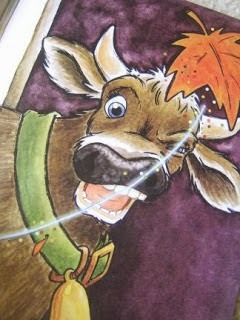 I found out about this book and got this idea from a post made by Frogs & Snails & Puppy Dog Tails. You can check out Jaime's post here. 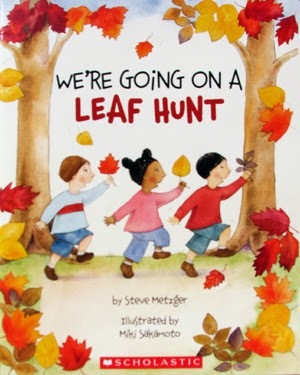 We have been using books about leaves to retell, make inferences, and count up. We read When the Wind Blew In. It is perfect for making inferences. We used the illustrations and our schema (what we already know) to infer what the animals were thinking and feeling. When we acted out the story we also made the faces the animals did in the story and talked again about the inferences we made. I know we have been acting out a lot of stories lately, but it has really helped my students with retelling and comprehension. We usually act out the story 2-3 times so that everyone gets a turn. Retelling using the characters is really helping my students too. For right now, it is working much better than beginning, middle, and end. I think all of this character retelling now will help us get to beginning, middle, and end sooner and to do a better job at it when we get there. Making inferences is new to us so this was a little difficult. My students finally inferred that the cow was surprised, the cow was scared, and that the cow was going to get hit with the leaf again, sneeze again, and get the animals all excited and worked up again. We are still working on nouns and verbs. This book is perfect for this too. There are lots of animal names and actions in the book. We sorted picture cards of the animals and their actions into nouns and verbs. Then we acted out all of the verbs in our sort. After the nouns and verbs sort I felt like we needed a little more work on nouns and verbs. I wanted to use the same book so that I could build on the work they had already done. We did a much better job after we made this bridge map. My students wrote the words on their wipe boards while one student helped write the words for the bridge map. I chose a few animals from the story for us to use. Then I had my students choose different actions than the ones the animals did in the story. We brainstormed several and the writer got to choose the one he or she wanted to use. We read We're Going on a Leaf Hunt. Then we retold the story using the settings. This was the first time we did this. After all of our character retelling they did a really good job with this. Then we made fall leaves to go with our retelling map. We acted out the story as we retold it. We used leaves and our giant ten frame to practice counting up to 10 from different numbers. My students made their own sets and counted up on their own ten frames while we did it on the big one. For example: I placed three leaves on the ten frame. Then we counted up from 3 to 10. We did this over and over counting up from a different number each time. I placed leaves in our counting jar this week. I found this large sparkly leaves at Walmart. This idea came from Investigations. Students count how many objects are in the counting jar. Then they make a set of the same number using another object. Then they record how many were in the set they counted and made on a post it. This student made his own set by stacking cubes into a tower. Then he drew a picture of 9 things on a post-it. This student matched one cube to one leaf. We made torn paper trees and torn paper leaves. Then we practiced decomposing the number 10 using the torn paper leaves. Each student had 10 leaves. They decomposed them into two groups with one on either side of the tree. After we practiced for awhile students made their own and glued everything down. You can find the unit which contains all of the clipart, recording sheets, and leaf project here.